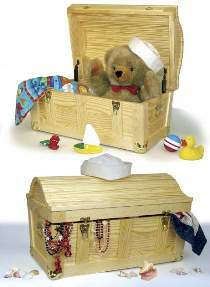 A nautical accent for your home, a child's toy box, or use on your boat to store boat lines, flares and other yachting accessories. Patterns drawn FULL SIZE. Made from 3/4" pine. Measures approximately 16"H x 26-1/2"W x 19"D. Small Treasure Chest Harware includes hasp, lid supports, trunk hinges, corners and a pair of handles. Project plan, wood, and wood finish are not included.